One of my biggest skincare concerns is pore care. Excess sebum, enlarged pores, and other pores issues can all be headaches. To make it worse, clogged pores can sometimes cause acne, which is another headache of its own. With all these issues you'd think finding the perfect products to cure and prevent them would be easy. But nope. Finding the right products that can help eliminate these issues can be just as hard, I would know. However, that doesn't stop me as I'm always on the look out for good pore care products to try and that's how I came across these Eclado Professional Formula Pore Ampoules. These Pore ampoules sounded promising and its lightweight formula is perfect for my combination to oily skin type. I was eager to test them and have been using them every evening for the past 3 months. What's the result? Read on to find out! 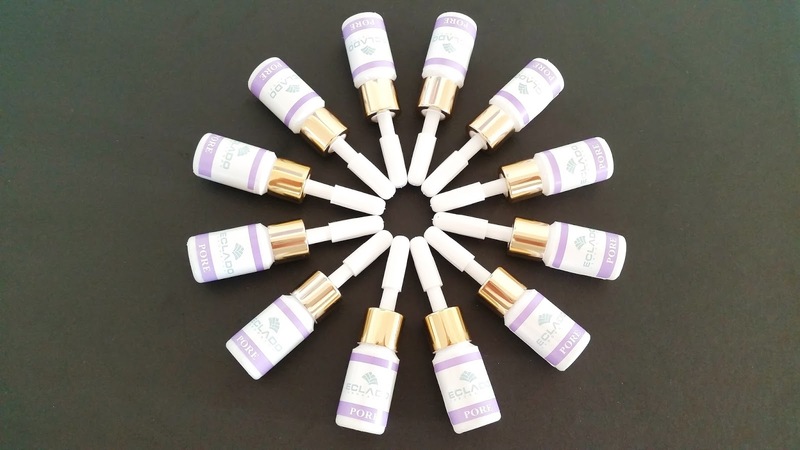 Eclado has 4 types of Professional Formula Ampoules. These ampoules are made with highly enriched ingredients that will give the skin intensive moisture and nourishment. The ampoules will protect the skin from the outside and deliver nourishment and elasticity deep inside the skin. The 4 Ampoules are Pore Ampoule, Collagen Ampoule, Snail Ampoule, and Vitamin Ampoule. The Collagen Ampoule is made with collagen and Argireline, extracted from carrots to help prevent wrinkles from facial expressions. It works to tighten your skin by increasing its elasticity. The Snail Ampoule is formulated with snail mucin to provide intense moisture and elasticity to the skin. It's easy to absorb formula penetrates the skin fast and gives dry skin the moisture it needs. Continue usage of this product will allow for smoother and more elastic skin. The Vitamin Ampoule helps to brighten complexion. It works by reducing melanin production while slowing the aging of the body. The ampoule is formulated with seaweed, papaya, and panthenol to heal the skin and brighten its complexion. 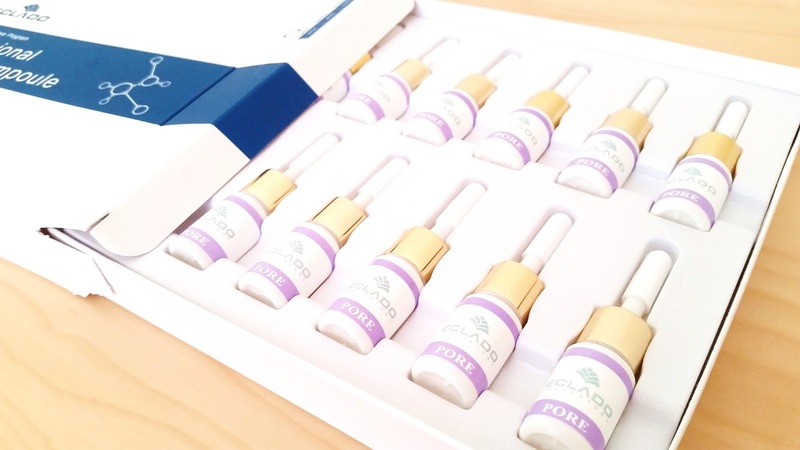 Last but not least, the Pore Ampoule. This is the one we will be talking about today, so keep on reading! 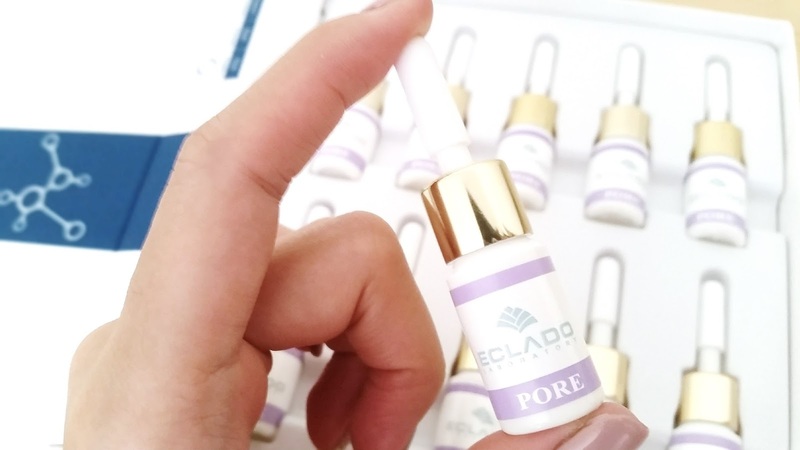 Product Description: Eclado's Professional Formula Pore Ampoule is a highly concentrated, lightweight ampoule. It's formulated with green tea, witch hazel, bergamot, sage, and tea tree to control excess sebum, soothe the skin, and minimize the appearance of pores. Its lightweight formula is perfect for combination to oily skin types, as it's easy to absorb and dries to a matte finish. To Use: Cleanse and tone the skin first. Squeeze a few drops of the ampoule out of the bottle onto the palms of your hands. Pat gently all over the face (avoiding the eyes and lips) until it's fully absorbed. Continue with the rest of your skincare routine. Ingredients: Purified Water, Glyceryl Trehalose, Hydrogenated Starch Hydrolysate, Hamamelis Virginiana (Witch Hazel Extract), Arctium Lappa Root Extract, Citrus Medica Limonum (Lemon) (Camellia sinensis Perafuta Extract, Salvia Officinalis (Sage) Leaf Extract, Calendula Officinalis flower Extract, Saponaria Officinalis leaf / root Extract, Camellia Sinensis Leaf Extract, Portulaca Oleracea Extract, Hydroxyethylcellulose, Melaleuca Alternifolia (Tea Tree) ) Leaf Oil, Citrus Aurantium Bergamia (Bergamot) Fruit Oil, Dipotassium Glycyrrhizate, Propylene Glycol, DMDM ​​Hydantoin, Disodium EDTA. 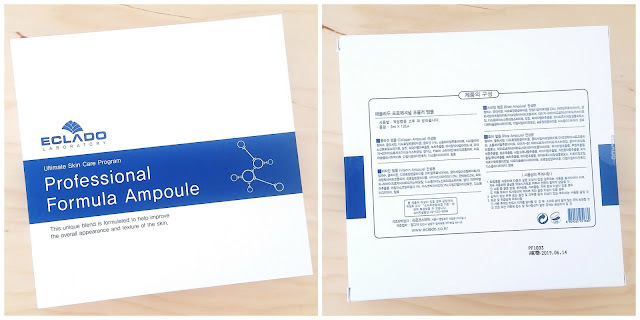 Packaging: Each box of the Eclado Professional Formula Pore Ampoule comes with 12 3ml bottles of the ampoule (as seen in the picture above). This packaging style is great for traveling and it ensures that the product is always fresh. You'll see in the images below, each small ampoule bottle has a plastic seal that needs to be twisted off before using. The outer box packaging of the product is plain and simple, with the product's name printed on the front and the ingredients for each of the 4 ampoules on the back as well as the expiration date. Scent: There's a super duper light, slightly herbal scent in this ampoule. It's so light that I can hardly pick it up and say what it is exactly. Since this ampoule is fragrance free, I imagine the scent is naturally from the ingredients, which I'm okay with. Color: The ampoule is colorless. Texture: Super watery! Its texture reminds me of most watery toners. 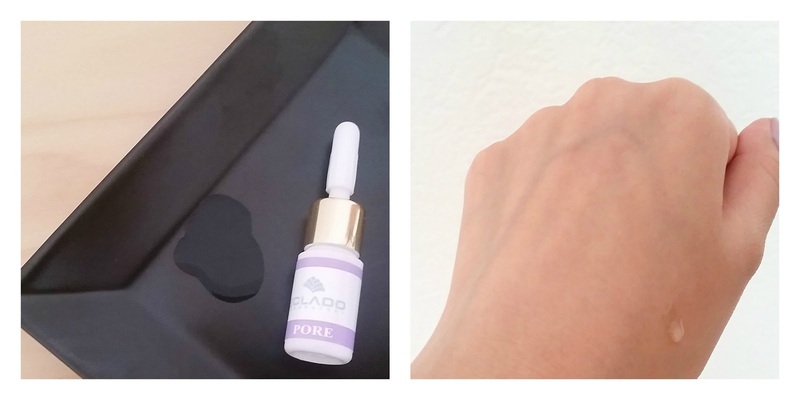 Michelle's Thoughts: This has been my favorite pore care ampoule for the past 3 months. I use it with my pore care serum and together the duo has been the best at controlling my sebum and soothing my skin. I think the 2 products works best together because they boost each other's effects, making them better than if they were on their own. Which is great for me, especially during the summer months when I can get oily so easily. With the help of these 2 products, I know I don't have to worry about it as much. I still have to reach for a blotting paper every now and then but it's not as crazy as before when I need like 10. All you combination to oily skin peeps out there, you probably know what I'm talking about. Plus, no excess sebum means no need to worry about makeup breaking down on my face and looking patchy. It also means less touch-ups needed and less worries. Perfect! For me, the Pore Ampoule's lightweight formula is perfect as it's so light that you won't even feel it on your skin. It dries to a matte finish and it doesn't leave behind any residues. The ampoule also absorbs super quickly, so I don't have to worry about any wait times in between products. I can just apply it and move on to my next product. Since this ampoule has a super watery consistency, I like to use it either before or after my toner, depending on the toner's consistency. If the toner is thicker I'll use the ampoule first and if the toner is thinner I'll use the toner first. Like many pore care products I have tried, this one isn't perfect either. The downside for this ampoule is its promise to minimize the appearance of pores. For the 3 months I've been using this ampoule, I've barely noticed it do much in that area. Which is disappointing, since one of the concerns us oily peeps have usually with our pores aside from excess sebum is our pore size. Although there aren't anything that can definitively reduce the size of your pores (unless you go under the laser), products can sometimes help to reduce the appearance of the pores and making them look as if they were smaller than they actually are. That's what this ampoule promised, but unfortunately it wasn't able to deliver on that promise. At least not for me. 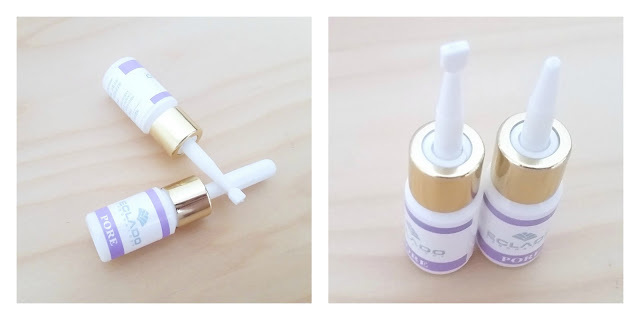 Final Thoughts: I really like this Pore Ampoule. Although it does have a downside, which I'm not too happy about, the pros it offers still outweighs the cons for me. The biggest pro for me and the main reason why I've been liking it a lot is its sebum control. I also like that it's fragrance free, soothes the skin, lightweight, and travel friendly! I recently took it on my trip and because it's already individually packaged I didn't have to worry about decanting it into a travel container. Would I purchase it in the future? Likely. If I don't find another ampoule that can offer everything and minimize the appearance of pores, I'd likely come back to this one. Do I think this ampoule is worth a try? Yes! If you are looking for something that can control sebum, definitely check this one out! Also, try it with the Pore care serum for the best effect! Have you found your pore care product? If so, what is it? If not, does this seem like it could be it?